'S e dùthaich ann an Afraga a tha ann an Saimbia,  neo Zambia ainm oifigeil: Poblachd Shaimbia. Tha crìochan aice san ear le Malabhaidh, sa tuath le Poblachd Dheamocrach na Congo, san ear-thuath Tansainìa, san iar le Angòla agus sa deas le Mòsaimbic, Siombabue, Botsuana agus Naimibia. Tha Lusaka na prìomh-bhaile aice. Tha am baile suidhichte ann an earra-dheas na dùthcha. 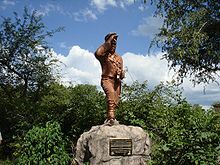 B’ e David Livingstone a’ chiad rannsaichear Eòrpach a ràinig air na Victoria Falls aig an Abhainn Zambezi anns a’ bhliadhna 1855. Chuir esan an t-ainm ris an eas airson urraim a chur air Bhan-rìgh Victoria. Air a tharraing à "https://gd.wikipedia.org/w/index.php?title=Saimbia&oldid=541542"
Chaidh an duilleag seo a dheasachadh 29 dhen Mhàrt 2018 aig 15:20 turas mu dheireadh.